An Atlas of Reds and Blues is a novel that spans a handful of critical minutes—as well as a lifetime—for its protagonist. As she lies in her own driveway in suburban Georgia, bleeding out from a gunshot wound inflicted by an officer of the law, the unnamed protagonist flickers between awareness of the present moment and reflects upon the pivotal experiences of her life. In spare, dry prose reminiscent of Mary Robison, Devi Laskar captures the fraught everyday experiences of a second-generation Indian American (“not American Indian,” as the protagonist is forced to explain to one of her teachers). Precise and unflinching, sometimes excruciating in its portrayal of life for those who are forced to prove on a daily basis that they are “American enough,” this novel is a timely investigation of racism and xenophobia in our country. Laskar is a former journalist, as well as a poet and photographer. She holds degrees from Columbia University, The University of Illinois, and the University of North Carolina, and her Pushcart-nominated poetry has appeared in Tin House, The Atlanta Review, Rattle, and The Raleigh Review. Her two poetry chapbooks were published by Finishing Line Press. A native of North Carolina, she lives in San Francisco, California, with her husband and children. This is her first novel. 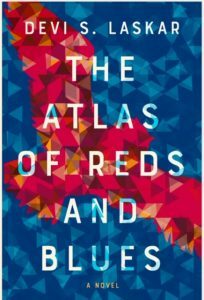 EP: The Atlas of Reds and Blues is written in exquisitely fractured prose that reads, at times, like poetry. This structure mirrors the protagonist’s movement in and out of awareness as she searches her memory for the moments in her life that have led to her lying injured in her driveway. Although the structure of this novel is unconventional, it’s difficult for me to imagine another structure that could convey the protagonist’s trauma more poignantly. When you first envisioned the novel, did you envision this structure, or did it evolve over several drafts? Do you feel that your background in poetry affected your choices in structuring the novel? DL: This was first a short story that I wrote in 2004 for a workshop. There was a 5,000 word limit and I chose super-short vignettes so I could give each of the characters equal time. I liked what I wrote enough to stick with it and make the story itself longer, but I enjoyed the brevity and I didn’t want to lose that in later drafts. I definitely wore both my poet hat and my reporter hat. As a poet I’ve always been interested in compression, trying to get a lot of mileage from a few choice words. So even after I gave myself permission to keep it short, I went back and cut sections to make it shorter, and to keep the pace moving. I think my photography also contributed to the structure, because I was really interested in creating snapshots for the reader. EP: The premise of the novel is, in a word, nightmarish: the protagonist lies in her driveway, bleeding out from a gunshot wound inflicted by an officer of the law, while other government agents (and her neighbors) stand around and make no move to help her. As chilling as this situation is, I found myself equally troubled by the recurring microaggressions (which feel anything but micro!) inflicted upon the narrator by white people who attempt to disguise their xenophobia and racism as well-meaning concern. Although the protagonist is aware of the danger of expressing (justified) rage in these situations, I’m curious what it was like for you to write these scenes. Did it bring up anger, or is did you find some relief in exposing this kind of hypocrisy and cruelty through your writing? DL: Great question! I have to say a little of both. It was a relief to be able to give the Mother a voice and a platform for her to speak her truth. There were moments where I was hopping mad and in tears while I was writing this novel. The Mother character is not me, but I did give her autobiographical moments so I could start writing from a place of familiarity. I wanted to put Mother in untenable everyday situations to show how pervasive the aggressions are. It was a relief to me as a writer that my narrator “saw” the micro-aggressions in everyday situations, like the night manager at the grocery store and the worker at the alternate dry cleaners – even if she couldn’t “do” anything about them. I wanted the reader to feel the same sting Mother feels when people use “bless your heart” as they subscribe to a racist stereotype. EP: Early in the novel, the protagonist and her sister inherit a pair of scarred secondhand Barbies along with an assortment of Barbie clothes rejected by a neighbor girl. Dissatisfied by their hand-me-down Barbies, which remind them of the ways they don’t fit in with their peers, the girls decide to “set them free” by floating the dolls down the river. Subsequently, the novel features short sections containing facts about Barbies, which also serve as commentary on American values and the representation of womanhood. How did you decide to use Barbie as a means to illuminate this particular theme? DL: I was born and raised in North Carolina, but I had the great fortune as a kid of traveling back to India frequently to visit my extended family and friends. My father is an academic (now retired) and because of his job we saw the world when I was young. Everywhere we went, people would ask me “Where are you from?” And I would answer, “America.” And then, no matter where we were or who was asking, their response would inevitably lead to the two things they “knew” about America: Barbie dolls and Coca-Cola. Everyone associates the iconic dolls with American girls. I wanted to play with these ideas – the dolls depict an impossible standard of beauty, are impossible to emulate, and yet girls are crazy for them and ultimately are disappointed. DL: I’ll say what I said to my children when they were younger and facing hard times at their schools: everyone has a superpower (a talent, a cool hobby) and everyone struggles. People fear what they don’t understand, so get to know your classmates and let them get to know you. You can’t control what other people do or say, but you can decide what tone you’re going to take. Ultimately, how you treat others will be the way you are treated. Try kindness. EP: The overall outlook of the novel is bleak; it does not offer hope for the protagonist’s particular situation, or for the predicament faced by immigrants and people of color in America. What, if anything, is a source of hope for you in these times? DL: I’m very hopeful about the future. I think people of color in this country are breaking their silences and the culture is changing; we are starting to have uncomfortable conversations and candid discussions about racism, misogyny, invisibility and being other. The more these topics are brought up, the more opportunity we have to make positive change. It is so difficult to talk about racism in this country without people getting defensive and angry—my hope is that people will read the novel and it will spark conversations about the characters and their struggles. Hopefully, the novel will provoke conversations that will lead to change in real life. EP: In the acknowledgements for the book, you cite the names of dozens of people who have helped or influenced your writing, including authors you admire. Though the act of writing is a solitary activity—and can also be, at times, a lonely one—you seem to be aware of the value of having a literary community. What does it mean for you to have people with whom to share and discuss art (your art, their art, any art?). DL: This is the best part of being a writer! I love my literary community. They keep me going. I love talking about books and stories and craft and poetry with my friends. I love celebrating each other’s successes. We need more diverse books, and we need more diverse voices. True and lasting change will only happen if all of today’s children can open books and see themselves on the pages.